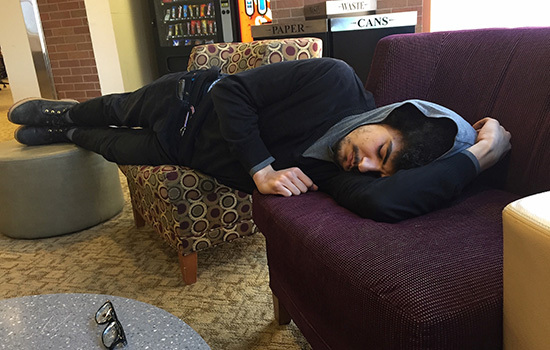 Kyle Suero, a third-year computer security student from Los Angeles, often catches a quick nap between classes in the Campus Center. It is one of five designated areas on campus students are encouraged to take short naps to help productivity and creativity. Students at Rochester Institute of Technology can now find the best spots on campus to catch a few Z’s between classes with help from “Naps,” a website that shows and rates places to get some shuteye. “We took a survey, asking students to rate locations based on comfort, loudness, accessibility and foot traffic,” said Rachel Tassoni, head of Student Government’s Facilities, Parking and Transportation Committee. She said the origin of the project began a couple of years ago after a petition was received by Student Government to find places where students could take naps between classes. Some students had complained they were awakened by people who thought they shouldn’t be sleeping, and couches they had once used were taken away. Dozens of RIT students responded to a survey asking where the best places to nap on campus were, factoring in comfort level, surrounding noise, foot traffic, convenience and accessibility. The list was narrowed to 22 locations across campus and of those, five were deemed “official” nap sites, designated by hanging posters which offer suggestions, such as limiting naps to no more than 30 minutes and using belongings such as book bags as a pillow to prevent theft. Eastman Hall, first floor lobby, 16 chairs. Campus Center, second floor outside the reading room, 10 chairs. Golisano Hall, second-floor lounge, six chairs. Grace Watson Hall, hallway outside the dining area, five couches. Gosnell Hall, first floor, two couches. Tassoni, a third-year diagnostic medical sonography major from Glocester, R.I., said she worked with RIT’s Physical Wellness Team who listed the benefits of napping from the National Sleep Foundation as better test performance, better memory, greater alertness, increased productivity and creativity, less mood swings and irritability, better judgment and a reduced need for caffeine. Although the best place for sleeping is in student housing, “any nap is a good nap,” said Timothy Keady, associate director of RIT’s Student Wellness. The best benefits come from short naps: 20 or 30 minutes. Any longer can mess up your sleep cycle, Tassoni said. Kyle Suero, a third-year computer security major from Los Angeles, likes the idea. He regularly naps before classes when he has the time. Recently, he had seven meetings on campus from 8 a.m. to 6:30 p.m.
“I usually drink a coffee, nap for 10 minutes and then wake up feeling pretty alert,” Suero said. Anyone can view the website, but only those with RIT identification will be able to submit or add their own napping location suggestions.